Put the crayfish in a freezer for 15 minutes before cooking. Bring the water to a rolling boil and add the dill crowns and salt. Add 5 crayfish at a time and when the water boils again, add 5 more crayfish to the pot. Start with the biggest crayfish and continue with this step until all the crayfish are boiled. Take the crayfish out of the pot and cool the stock. Refrigerate until cold. Chill and refrigerate the crayfish. When the stock is cold, add the crayfish back to the stock and refrigerate for 24 hours. Chop the crayfish meat. Strain and put it into a bowl. Chop the onions and dill very fine. Add to the bowl. Add the creme fraiche to the bowl and stir. Roll the dough 1 mm thick and then roll it with a pastry docker. Cut the dough into 15 cm squares. Put the soft squares in a muffin tins to create bowls. Bake in the oven for 10 minutes or until crisp. Let the bread bowls cool on a wire rack. 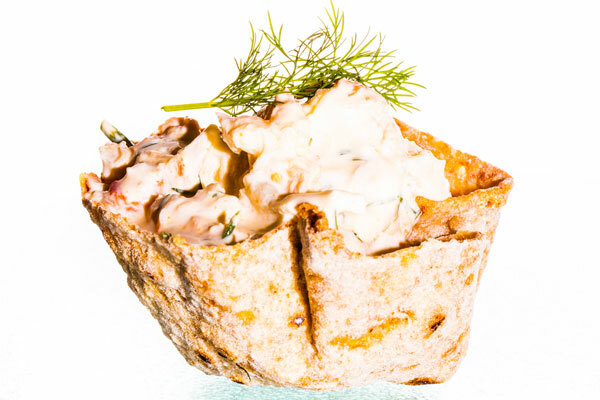 Put the crayfish salad into the dried flat bread bowls and serve with a dill twig on top.